There are a few things I would consider my 2016 obsessions: rearranging my home 100 times, color combos such as rose quartz and serenity or blush and olive green, watercolors, palm prints/Palm Springs, annnnnnd PINEAPPLES! Thankfully, the retail industry has satisfied my little heart's desires with an abundance of items inspired by this quirky fruit. 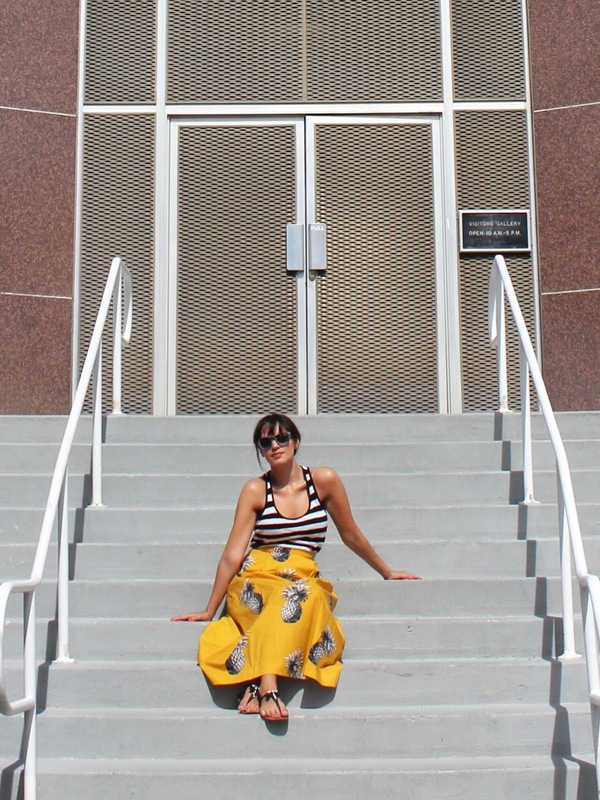 I bought this Pineapple Maxi Skirt from Ann Taylor as soon as it was in stock at the store. And before you start thinking, "Geeze Elisabeth, impulse buy much?" you should just know that they were selling multiple items in this print (shorts, dresses, etc) and I had the self control to only buy the skirt. SO BACK OFF WITH YOUR JUDGMENT, Judgey McJudgerson! Ahem. A little reflection on my love of the pineapple: I can relate to this little guy. Like me, it's skin is a little bumpy and hair always seems to sticking out at odd angles but inside it's sweet or tart (depending on timing), and full of Vitamin C (okay, maybe I'm not full of Vitamin C-but the rest I can relate to). While it may be tough to get through its outer layer it just makes it that much more satisfying when you get to reap the sweet sweet fruits of your labor. It's got an awesome name that makes no sense and is fun to say. 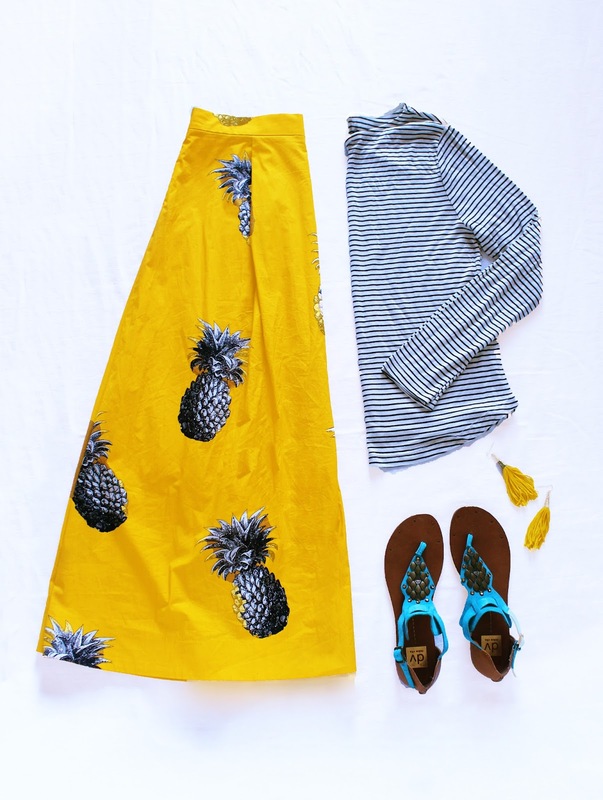 The Pineapple is quirky and fun and always gives makes you think of summer, but without the required imagery of picnics or BBQs (I'm looking at you watermelon!). 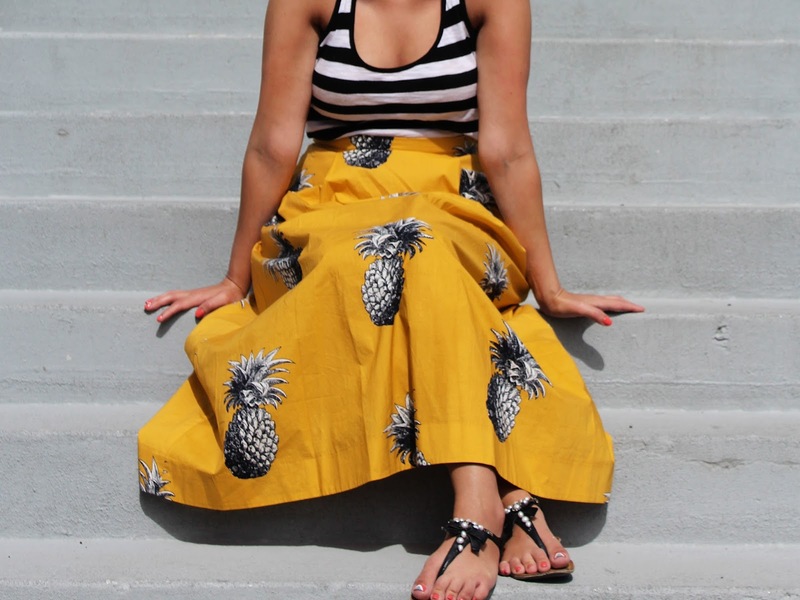 TLDR; I <3 Pineapple + I am so glad there are so many fun prints or items with it this year. What is your favorite prints or trends right now? Do you also dream of pineapple? Tell me about it! PS: If you have any suggestions of outfits to try with this skirt please let me know! I'd love to try them out.